Have you ever been cleaning your home or business with bleach or a traditional cleaner and choked on the over powering smell? Maybe you were bleaching your bath or shower and your eyes started to water? Have the fumes from a cleaning product ever caught the back of your throat and caused you to cough? If you have had any of these experiences, have you ever wondered what damage these products may be having on your health? There are several environmentally friendly cleaners and multi-surface spray options on the market today, that are just as effective at killing bacteria as disinfectant, and they are kinder to you and the environment. 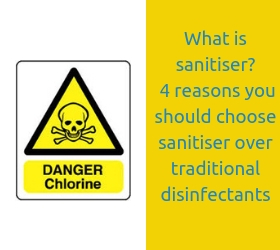 We are going to concentrate on traditional cleaners and examine why you might consider choosing a sanitiser, specifically electrolysed water, over a traditional cleaner or bleach? Is bleach dangerous for children? Bleach is a corrosive, hazardous substance and the majority of people understand the highly dangerous implications if it were to be swallowed. Have you stopped to consider the issues that can arise when the fumes from bleach (chlorine) are inhaled? Even after bleach has been applied to a surface and rinsed, the fumes are still present in the air. Studies have shown that chlorine has an adverse effect on the respiratory system of children. Household with bleach usage showed a higher number of asthma and allergy sufferers than in homes where alternatives may be used. Sanitiser is as effective at killing bacteria and viruses as bleach however because the ingredients are salt, water and electricity only, means that the substance is safe to humans, animals and the environment. If electrolysed water were to be swallowed it certainly would not taste nice but it would not pose any dangers or ill effects. There are no toxic fumes that are emitted from electrolysed water, making it safe to use around children and animals and also in food preparation areas. Is bleach dangerous to cats and dogs? Ultra-concentrated bleach can result in severe lesions on the skin, and in lesser cases, skin irritation. If your furry friend happens to ingest any of these products, toxicity could result in complications within the digestive and respiratory systems. Animals use their sense of smell to understand their surroundings; the strong smell from bleach reacts with your dog’s olfactory receptors, damaging them and can result in ‘nose blindness’. Damage to these receptors leaves them unable to process the world around them. If you suspect that your pet may have inhaled or ingested a toxic chemical always seek medical advice from a vet. Remember; not all dogs have the intelligence of Lassie; animals are inquisitive and ultimately led by their nose and their stomachs. Exposure to any chemical comes with its own risks; a weak solution of bleach may not have any obvious effect on a St Bernard but could have dire effects on a Chihuahua. There is a slight smell to sanitiser; once the ingredients have undergone electrolysis one of the resulting oxidant species is Hypochlorous acid which gives the solution a slight smell of chlorine. Hypochlorous acid is present by less than 50 parts per million (ppm); this is the equivalent to 0.005%. Acid?! That sounds bad – wrong! The human immune system naturally produces Hypochlorus acid and is released by our white blood cells to fight infection. When you have a cut or a graze, this is an open door to bacteria. Your body’s white blood cells swarm to the area of damage and produce Hypochlorus acid killing any bacteria that comes in its path. The Hypochlorous acid content in the electrolysed water kills bacteria and viruses on contact but remains safe to animal, children and you or I. How does bleach effect the environment? If bleach is safely disposed of down a waste pipe it will go through a waste water treatment plant ultimately, having no direct effects on the environment. However, when chlorine is poured down the drain it can come into contact with other substances already in the system, potentially causing a dangerous chemical reaction. This then releases dangerous gases and fumes which can end up back in your home or business. When disposed of irresponsibly, chlorine can have an adverse effect on marine life and wild life. The environmental pollutants created with incorrect disposal of bleach have been linked to the decrease in certain bird and fish populations and even directly associated with cancer in wild animals. Over time, electrolysed water returns to its constituent parts (salt and water) meaning that it poses no threat to the environment. Is sanitiser better at killing bacteria than disinfectant? Sanitiser and disinfectant are both on par when it comes to killing bacteria and pathogens. The important difference here is that a sanitiser kills bacteria at a much faster rate than a disinfectant. A public house cleans its glasses with a sanitiser; as the contact time to kill pathogens, is less than 30 seconds it eliminates bacteria and viruses quickly, saving any time that may be wasted waiting for the glasses to be ready for use. This next example could be applied to both a domestic or commercial situation. Imagine you are cooking a meal; you plan on handling raw meat, vegetables and fish during the process. Between each food type you need to ensure than any remnants of the last product are not left on the top to avoid cross-contamination. Using a disinfectant would kill the same pathogens as a sanitiser however; it would need a longer contact time in between application to ensure the surface was free of any bacteria. In addition to the time element, some disinfectants like chlorine continue to emit fumes after application. A number of sanitisers are safe to use around food so are therefore the preferred choice for a number of industries. We get it, some people may be wary about change; electrolysed water may sound like an unconventional approach to killing bacteria safely. How does electrolyzed water work? I know what you’re thinking; 'how can a safe, non-toxic product be effective at killing germs'? A generator splits a very weak saline solution entering the generators core, into positively and negatively charged solutions. The negative ionic solution contains a mix of relatively short lived oxidant species and this is what we refer to as electrolyzed water (ESOL™). What ingredients are in Electrolyzed oxidizing water? The solution creates an environment outside the working range of important microbial processes, including energy-generating mechanisms. Pathogens will come into contact with powerful oxidants which will sequester electrons from microbial structural compounds, causing the rupturing of biochemical bonds and subsequent loss of function. This is often described as an 'oxidative stress'. Put simply; when electrolyzed water comes into contact with a bacteria or virus, it causes an imbalance, breaking down its defences and rendering it harmless. A number of us make sure children and pets are out of the room when we are using bleach and strong cleaners. If we suspect that these products have a harmful effect on animals and humans, why do we still use them? If there are safer more sustainable products available what is holding you back from making the switch? Do you have more questions surrounding electrolysed water? What environmentally friendly, safe options are available on the market? Dangerous substances – Is your workplace toxic, what are the alternatives? What non-toxic cleaning products are available to clean my dog crate?